Casio Privia PX-S1000 Review: PX–S1000 is the most recent version (2019) of the Privia Series Digital Piano from Casio and now its my new favorite keyboard. 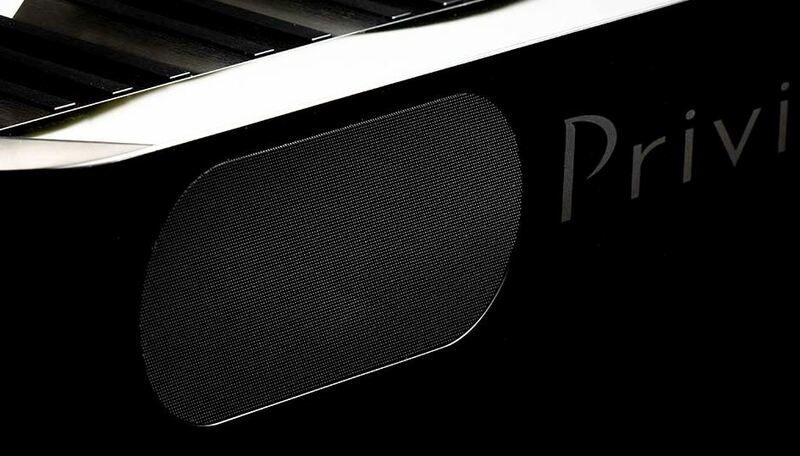 The PX S1000 has 88 keys, 192 notes polyphony and hammer action key bed. Hammer actions keys simulates the feel of a grand piano and PX S1000 take this experience to a whole new level. All in all Casio Privia PX S1000 can be considered a great option if you are serious about your musical journey and looking for something in under Mid range. So, Lets see what PX S1000 offers to us. PX S1000 is loaded with tons of features and some of them are only available in Casio Privia series. One of the feature that most of the keyboard brands lacks is the “Hall Simulator Effect”. The Hall simulator effect gives you the sound of hall reverb. It just needs a push of a button to activate and deactivate the feature. The effect is very useful and help you understand how your music sound on auditorium and provides perspective from an audience point of view. The judgement helps you to make better decision according to the environment. Something interesting you might notice is the button layout of the board. The front buttons are touch sensitive and they gets lits when activated. They are actually very easy to see. Suppose if you are in a low light condition or something similar than you don’t have to worry about reading the small prints written over the function button’s. Because it all lit up which makes it quite easy to see in the dark and also very easy to operate too. The touch buttons are highly responsive and just needs a feather touch to activate. 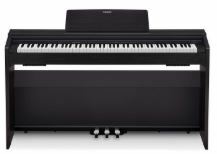 The overall user interface of the PX S1000 is very simple and is very easy to operate if you have any prior experince with digital pianos. 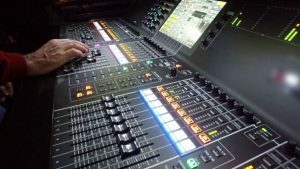 Related : 10 Audio Mixers In Affordable Price Range. One thing that might confuses you initially is how you can change the different instruments sounds because PX S1000 does not have dedicated knob or button for that. 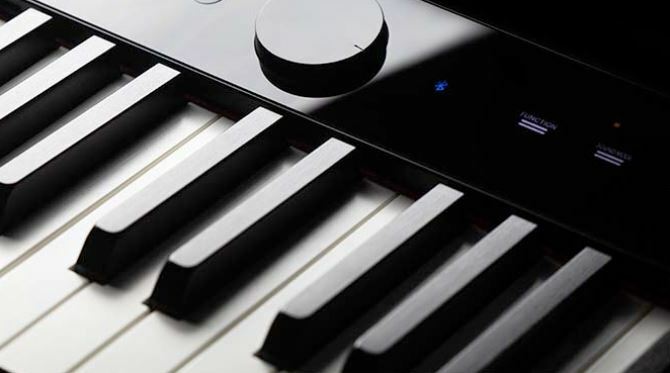 To do so you need to keep hold the function button and then you need to press the specific assigned musical instrument key (button) on the keyboard. Almost every other features like switching Bluetooth on/off or to change MIDI setting or any other setting you need to follow the same procedure (holding function key and then pressing the keyboard key). 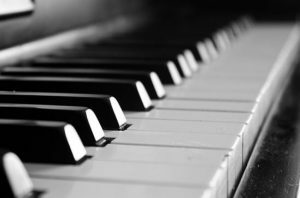 For example if you want to play the electric piano sound you need to hold down the Grand Piano function button on top and then click the D key from the board. All of the extended functions of the keyboard are handled by this way only. It is something I have a mix reaction upon. 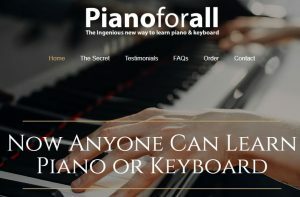 As removing lots of dedicated buttons makes the piano layout simple and gives a luxurious look but on the other hand it is quite confusing for newbies too. Some of the basic instruments sounds the board has is of harpsichord, strings, a faster string sound (not available in any other piano), pipe organ, and more organ sounds. Another important feature for any pianist is the layering and splitting functionality and PX S1000 does not disappoints on this. Layering allows you to play 2 different instrument sound simultaneously. 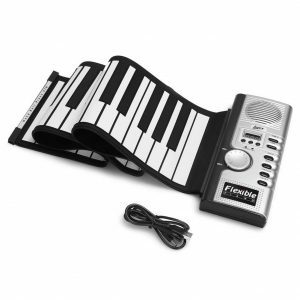 And the splitting functionality divides your keyboards in two half which comes very useful if you are a piano teacher. Because you can teach your student side by side. From my experience this is makes learning keyboard very easy. As our generation is shifting toward more and more smart devices than why would PX S1000 not adopt to the change. As it provides easy connectivity with built-in Bluetooth. With Bluetooth you can connect it with your phone or any other Bluetooth device. 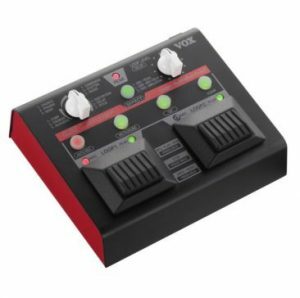 This come useful when you are practicing along with the recording of a song that you’re trying to learn to play the sound directly from the piano speaker. It is great because you can practice along with music track from other device. No doubt Sound of the PX S1000 speakers are very good. It also has 2 headphone jack to play along with your students (if you are a teacher of-course). If you keep on moving from venue to venue than you can understand the pain of carrying the keyboard, in long run it will result in sever back pain. This is why Casio has tried to make PX S1000 lightweight (25 pounds) and portable so you can move along with ease. It also works on 6 AA batteries so you can play it wherever you want and wherever you want. (The life of the batteries is upto 4 hours). As I said earlier people are more and more relying on apps to make their life more convenient. This is why Casio has also introduced a app name as Chordana Play. You can download it from play store or apple app store. Chordana app allows you to play MIDI files downloaded from the internet. It also displays chords, and highlight the specific button which you need to press to play the songs. 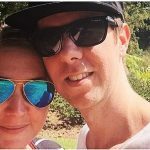 This is a real treat for beginners and intermediate too. 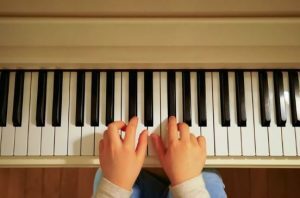 It makes learning piano quite fun and easy. Overall I can say that the PX S1000 is really a good piano. There is hardly any room to improve the keyboard. I also liked the futuristic looking touch sensor control panel they simply looks awesome. It is also quite sleek, portable, and lightweight too (13 Lbs). Loads of sounds, 88 keys, lit up function keys, AC/DC power option, sustain pedal, Bluetooth and lots of other makes it the perfect choice of anyone who does not want to compromise on functionality. PX S1000 generally comes up with music stand and sustain pedal. But the brand also provide and option to get 3 additional pedals units. Smart Hammered keys are just perfect. The ebony and ivory color keys looks quite luxurious as well. It will definitely increase the beauty of your room too. The price of Casio Privia PX S1000 can be categorized as cheap when comparing it with all the latest features it offers, this is what it makes one of the best option if you are looking for some better investment for long run. So that’s all from our end hope this Casio Privia PX S1000 review helped you guys to make a better decision. This entry was posted in Casio, casio privia keyboard, Keyboards (Piano). Bookmark the permalink. 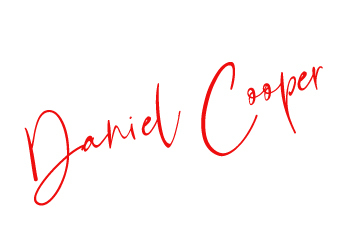 Thanks for the review, Daniel. What is smart scaled hammer action keys? Are they regular graded hammer action keys or they offer something more? Smart scaled hammer action keys offers an uncompared authentic touch and feel of a real acoustic keyboard. Although the overall concept is the same weighted keys which significantly gets lighter when moving toward the other end. 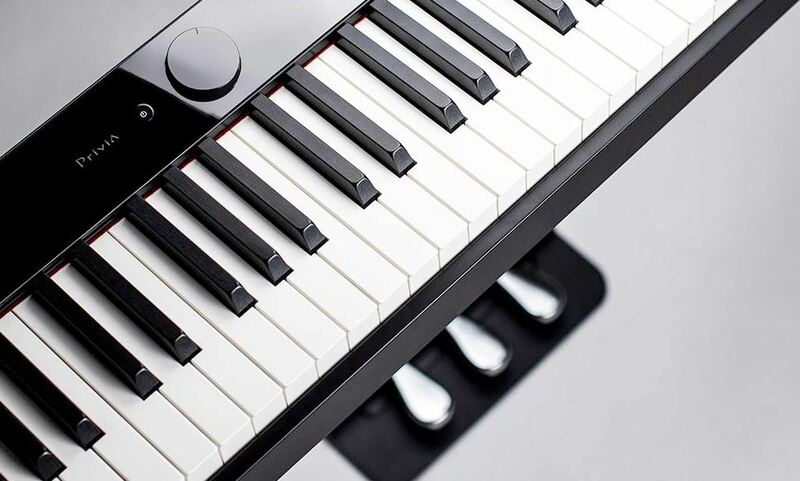 The sensitive touch and feel of the ebony and ivory texture keys make it smart.